British troops have been used to demonstrate weapons made by private arms companies to countries with dubious human rights records including Egypt and Qatar, government records reveal. 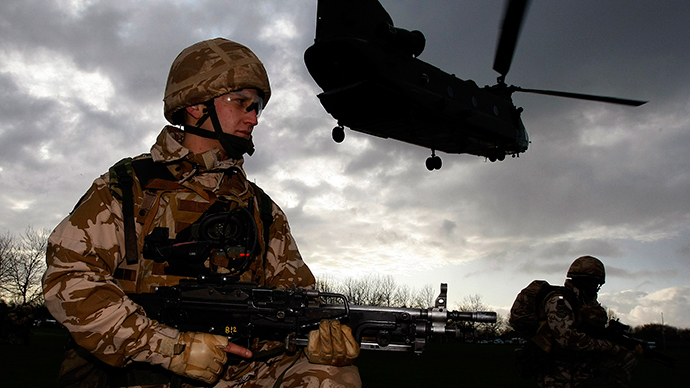 Sales events hosted by the British Army seek to boost the UK’s arms industry by marketing a variety of products, including drones and cyber-warfare equipment. UK armed forces personnel hosted Qatari officials on two occasions last year as part of the government’s plan to increase sales to the wealthy Gulf state. The Egyptian military was also given a demonstration of products made by UK arms firm Eskan Electronics at Larkhill army base in Wiltshire last year. Documents obtained by the Guardian newspaper through Freedom of Information (FoI) requests indicate the majority of sales presentations in 2014 took place in the Salisbury Plain region. A handful of demonstrations also took place in Gibraltar, the Philippines, and the United States. The records are from UK Trade and Investment (UKTI), a government department within the Foreign and Commonwealth Office and Department for Business, Innovation and Skills. Sales pitches were hosted by Export Support Team (EST), a branch of the UKTI Defence Security Organisation (DSO) which promotes UK arms exports. “It is particularly concerned with helping smaller companies, especially those new to the defense industry or to export,” the video’s narrator adds. Several of the demonstrations listed in the Guardian’s findings are for multinational corporations, such as Lockheed Martin and BAE. Arms firms are offered the opportunity to exhibit with UKTI DSO at international fairs at a cost of £1,280 for a basic package, which includes government and military staff working with the company to plan a two year business program. For an additional £1,195 a company can buy a “premium” package which includes use of government meeting rooms and invitations to official briefings and receptions. Speaking to RT, Andrew Smith of Campaign Against the Arms Trade (CAAT) said: “The military should not be used to promote arms sales and enrich arms companies, this is yet another sign of the close and politically compromising relationship between arms producers and the government. Caroline Lucas, who is seeking re-election as the Green Party’s MP for Brighton, said: “This is a staggering admission by the government. “Our soldiers should be spending their time training, not acting as cheerleaders for private companies. “I’m sure most of the public will be as alarmed as I am at the idea of our soldiers becoming salesmen attempting to flog weaponry to dictatorships like Saudi Arabia. The Conservative government are at pains to say they want free market competition, so why are privately owned armaments companies allowed to use our soldiers as part of their sales force?” she added. Saudi Arabia is the UK’s largest customer for British arms, according to CAAT. The Gulf kingdom is leading a coalition of nations, which includes Qatar, in ongoing air-strikes against Yemen, which have resulted in 551 civilian deaths as of last Friday, according to the United Nations. CAAT believe Saudi Arabia may be using British weapons in their assault on Yemen. Egypt’s military regime has also come under scrutiny in recent weeks, after a judge convicted and sentenced 14 Muslim Brotherhood members to death and 37 to life in prison. The nation’s trial of former Egyptian President Mohamed Morsi has been described as “badly flawed” by Human Rights Watch. Morsi was sentenced to 20 years in prison last week for inciting violence.